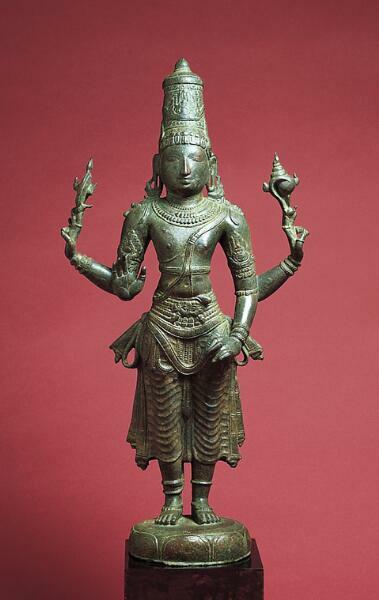 Hindus worship Vishnu as the preserver of the universe. He descends to earth in different guises to restore the balance between good and evil. In his upper hands he holds a discus and a conch shell. The discus is a warrior’s weapon, and when Vishnu blows the conch, he is said to strike terror into the hearts of his enemies. His lower left hand makes the gesture of leaning on a club, another weapon that he uses to restore order. His remaining hand is held up in the gesture of reassurance, to comfort his devotees. This Chola bronze may be smaller than others in the collection, but it is one of the most handsomely proportioned and exquisitely detailed. Notice the tiny flames on both the conch shell and discus, demonstrating their unearthly and radiant nature. Vishnu is displayed here with his consorts on either side. To your left is his principal consort, Lakshmi, the goddess of wealth and fortune, also called Shri Devi. To your right is Vishnu’s second consort, Bhu Devi, Goddess Earth. Vishnu rescued her from the depths of the cosmic ocean in his incarnation as the great boar.